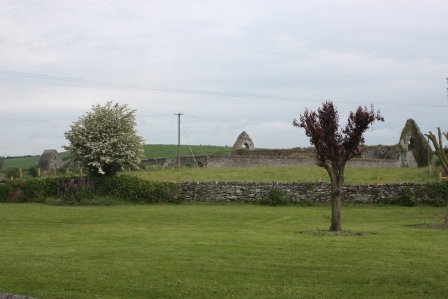 Historic St. Mary’s Abbey and St. Mochta’s House in our own little village. The weather has really been lovely the past week here in Ireland. It’s been sunny, warm and dry. I can’t ask for more than that! As I was driving home last night, the sun setting on our local historic structures made them look even more majestic than I find them on any given day. So I decided to capture some of that beauty today with my camera. Of course today was overcast and the view is not exactly the same, but I find it special none the less. 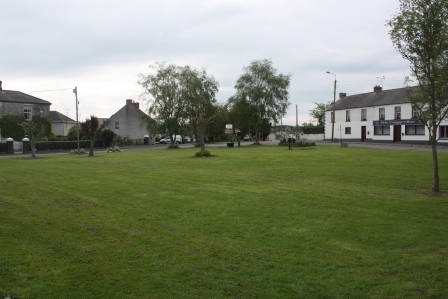 We have two interesting pieces of history in our little village called Louth Village, in County Louth. 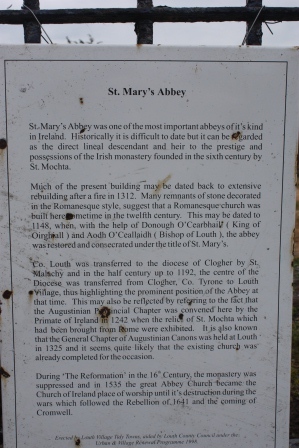 The first is St. Mary’s Abbey. The present structure dates back to 1312 when extensive rebuilding took place after a major fire. 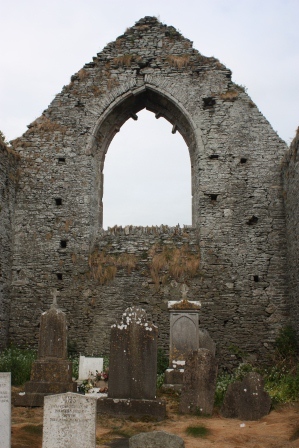 There were apparently findings to suggest a Romanesque church building existed and was built sometime in the 12th century. 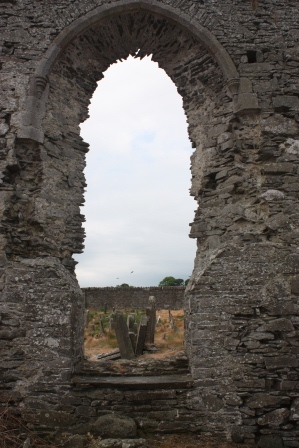 There is a stone wall surrounding the Abbey and graveyard. 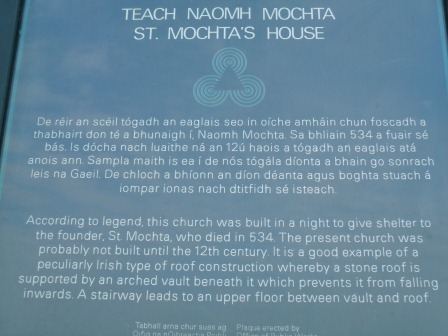 The second interesting piece of history is St. Mochta’s House. 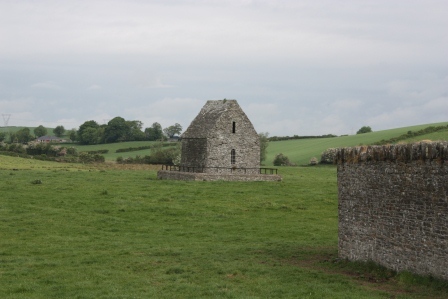 This structure is one of the few remaining connections left to testify to the early existence of a monastery of Irish monks founded by St. Mochta. 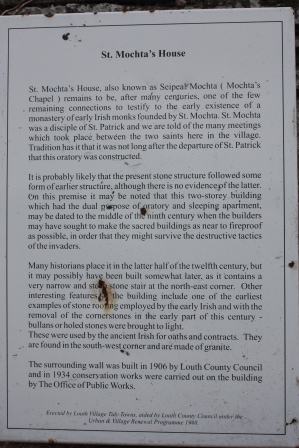 St. Mochta was a disciple of St. Patrick and there are stories of many meetings between the two which took place right in our village! There is thought that the current structure was possibly built in the 9th century. 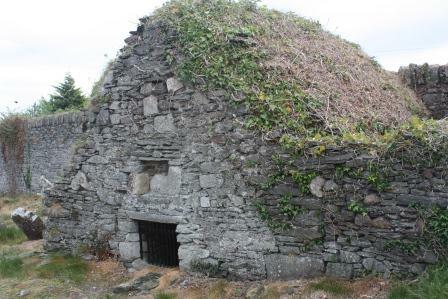 It is a two-storey building for an oratory on the ground level and sleeping quarters above. 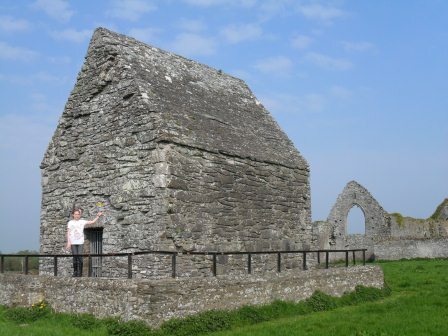 Legend claims that it was built in one night while St. Mochta slept! He died in 543. 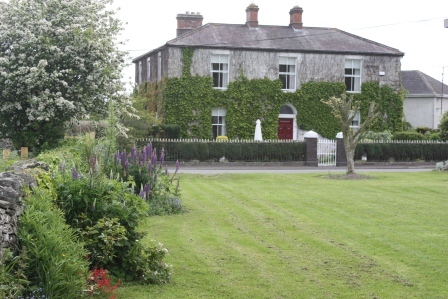 The surrounding wall was built in 1906 by the Louth County Council, and conservation work on the building took place in 1934 by the Office of Public Works. I was glad to learn that there is an active effort currently going on to continue conservation work. As an American living in Ireland, I find the history so intriguing! I even took a picture in the graveyard of a Monument built in 1800 which was erected simply for James Carroll and his posterity. 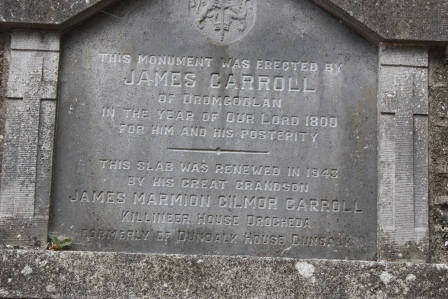 The slab was renewed by his great grandson (James Marmion Gilmor Carroll) in 1945. All I have to say it “neat!”. I hope you enjoyed the little tour of some of my village! I’ll have to capture some more pictures when the sun is shining! Two signs greet visitors to the Abbey. 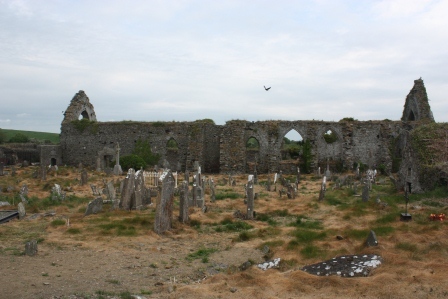 A view of the graveyard and St. Mary’s Abbey. 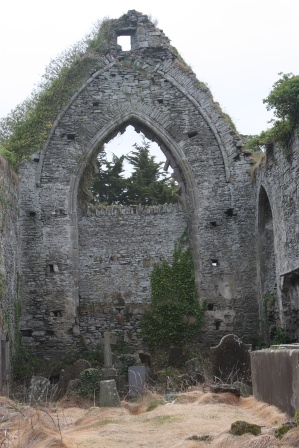 This structure is within the walls of the graveyard at the Abbey. 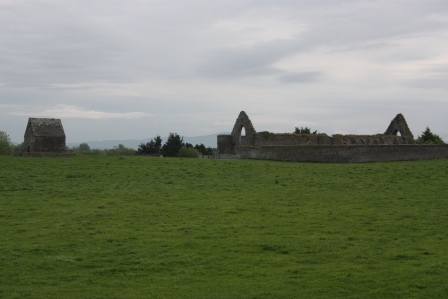 What is left of the Abbey. 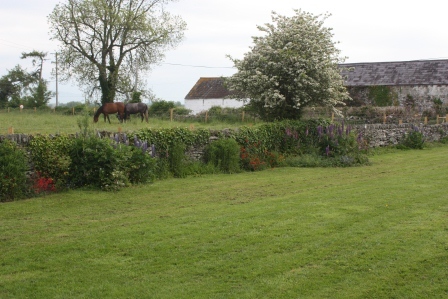 St. Mochta’s House in the field, next to St. Mary’s Abbey. 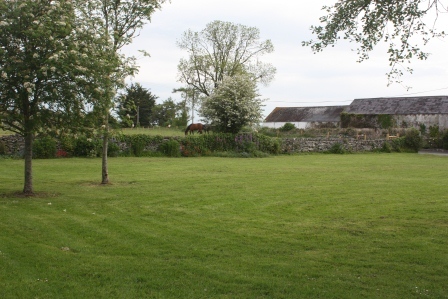 Below are pictures of the green around the Abbey. If you look closely you can see the Abbey in the background. A lovely house below, looking onto the green. 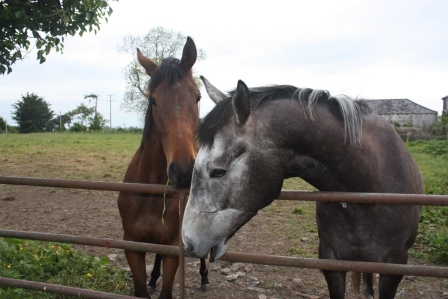 These two friendly fellows came over to say hello while I was taking pictures! 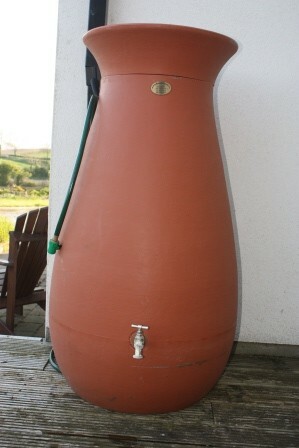 A pretty “rain catcher” for our garden. 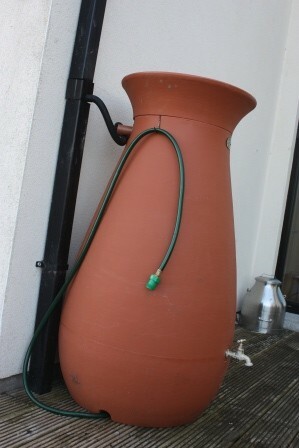 I used it this morning to water the garden. My watering can fits right under the water tap. It’s nice and easy! We are finally getting some real heat! It was 22 degrees Celsius (73 degrees Fahrenheit). By Irish standards, this was quite warm! I have to say it really was a comfortable temperature. The sun is what made it perfect. 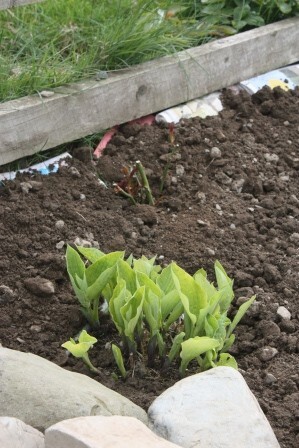 Everything is taking a growth spurt in the garden (including the weeds)! I’ve had a very unglamorous week of weeding. I thought the two pictures below were pretty enough to show you. 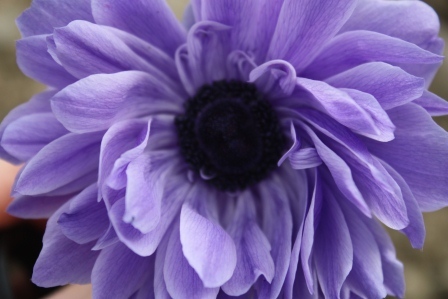 I hope your garden is getting some sun, and you too! 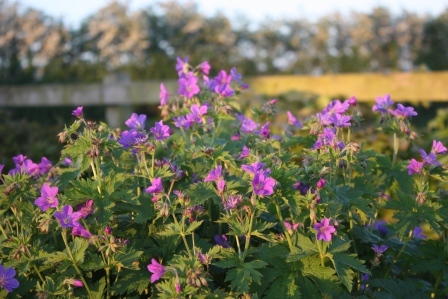 Blue Geranium in the evening. 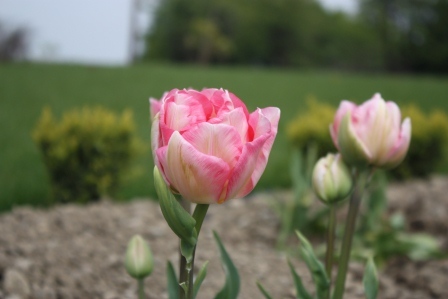 These were given to me by my friend Susan, and they have just thrived! Such an easy plant to tend. 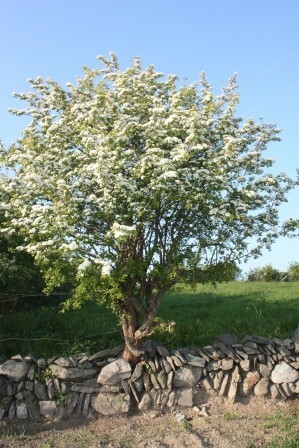 I think my Hawthorne is really looking well in full bloom! 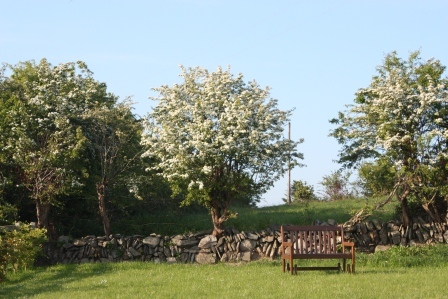 Ditch wall and our Hawthorne trees. 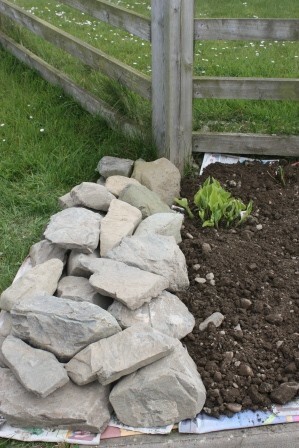 A wee stone wall at the front gate garden. 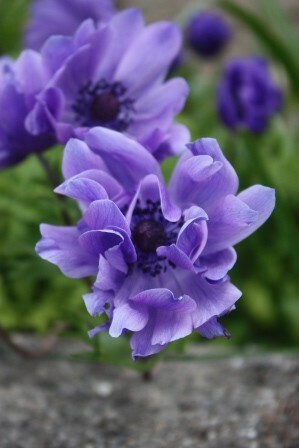 climbing roses., Mr. Fokker Anemone., Tree Peony. It is sunny today! 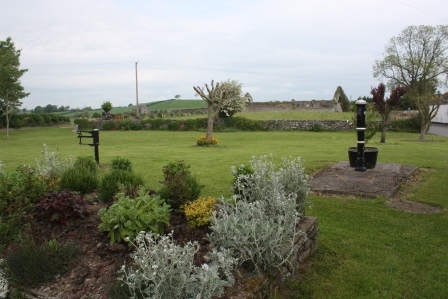 And even somewhat warm (14 degrees Celsius, 57 degrees Fahrenheit) so out in the garden is where I was all morning. I came across some really nice stones in one of our local fields recently. The owner had a laugh when I asked, but he agreed to let me have as many stones as I’d like, so long as I didn’t disrupt his potato crop. That was fine by me! The kids and I hauled a bunch of stones back to our place. There are big ones, small ones, flat and rounded ones. I’m not exactly sure what I’ll be doing with them, but for starters I’m using some to finish off the front garden at our gates. I think it’s a stretch to call it a wall, but for lack of a better name, that is what I’m calling it! There are two hostas in the front garden by the gate, and two newly planted climbing roses (Zephirine Drouhin 1868). My hopes are that the roses will climb along the fence (we’ll see!). 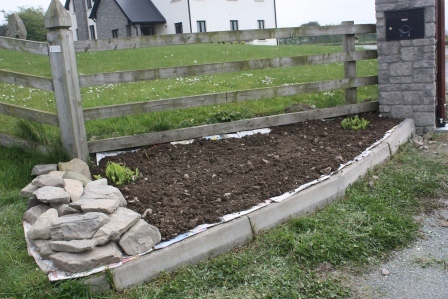 I’ve put down wet newspapers to keep down any grass, and then some topsoil. I think by Fall I’ll have some more ideas of what I’ll want to plant here. 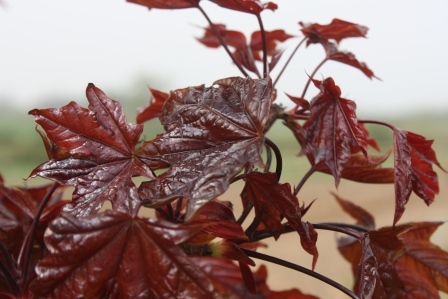 I also took some more pictures of life around the garden. 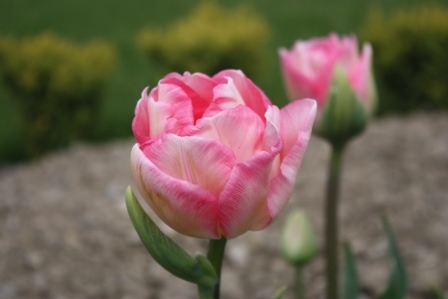 My Angelique tulips are really in full bloom now, and look so much nicer in sunlight! 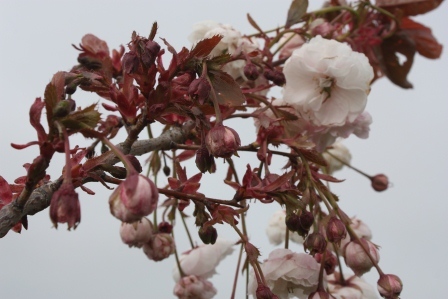 The cherry tree, and maple tree are showing their beauty. 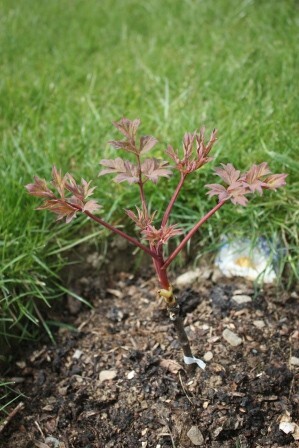 I wasn’t sure how my new Tree Peony would do when we planted it as there was very little of a root system on it. But it seems to have taken hold and is growing. 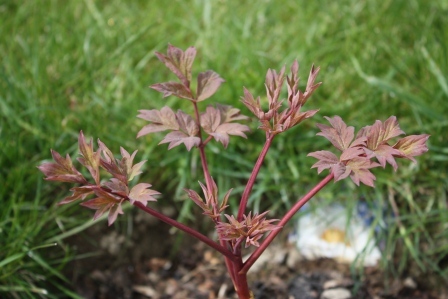 I didn’t take a picture of our Japanese Maple because it is completely wind destroyed! We will be looking for a new location for that very soon. 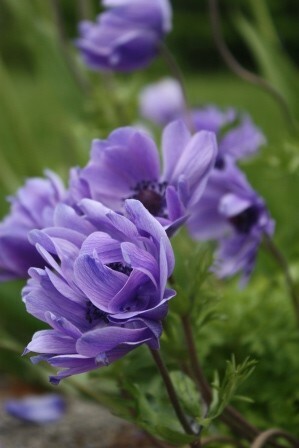 My purple anemone have to be one of my favorite flowers this year with their amazing color! (called Mr. Fokker). 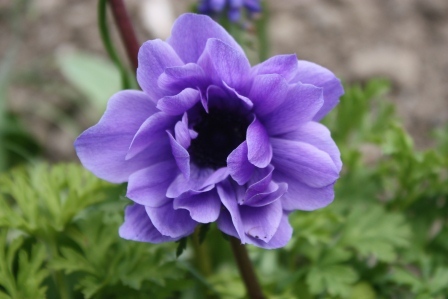 There are just two days left to my swimming course this weekend, and then I can work a lot harder in the garden! 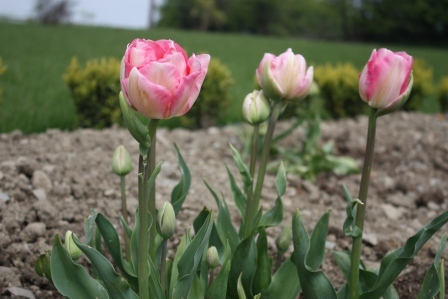 I hope you are able to spend some time outside in the sunshine! The wee wall, hosta, and climbing rose plant.